Putting aside the fact that I don't know much about the laws of physics, or the intricate details that go into creating an electronic device, or call myself a biology expert, I feel like sharing some things that I think should be a part of our future (I am an expert on dreaming of cool things - self-proclaimed that is). And when I think these should be a part of our future, I also think it should be in my lifetime so I can enjoy and experience them. Flying cars - We've all seen them in the movies, and have all thought by now that they'd be a common thing. And yet they're not. And I'm disappointed. 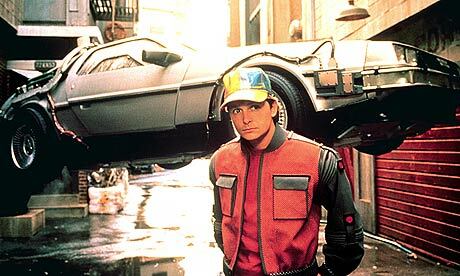 I feel I've been gypped by Hollywood, and someone should fix this by coming up with an economical and pollution-free way of making flying cars an actuality. How cool would it be to have a flying car? I have always wondered though how air roads would work. I picture something similar to Back to the Future II where everything is lit guiding the way, which would make it nice at night, but in the daytime would it be just as clear? Regardless, I think someone should make this a reality now. Hover boards - And while we're thinking about Back to the Future II, we should discuss how cool it would be to have a hover board. I've thought this one through (with the help of The Uglies book series) on how if you had a metal grid of some sort underneath the pavement and side walks, you could easily make hover boards real. Just don't go over water like Marty did. This is all theoretical of course, and again I nowhere claim to be an expert, but this seems doable to me. It could be another, yet simple form of transportation, and the trade off of zero gases expelled from the board with the cost of an underground metal grid would balance out over time. Yep it all makes sense. Internal Data Connection (IDC for short) - I don't know if this is a must have thing, but something I could see happening in the future. Whether it's tethered to the brain directly, or through a lens you wear in your eye, I see us being connected to the internet and everything else this way. I see the cell phone morphing into this same technology, whether it's a video chat or just audio. Our brains will be able to think what we want to look up, and it will then be seen through our eyes, or projected onto a screen wall or smaller object. The only thing I can see causing an issue would be driving, walking or doing anything mobile. And this is where flying cars would come in handy and we would just add auto-drive to them. I don't know how to fix walking though.... (I do have to admit, I may have borrowed a lot of this from The Uglies book series). and an eye projecting an internet image if you really need the visual. Fat Burner Supplement that works and is good for you - This needs to be made now. I'm not saying this so that we can all be lazier, because I still think that exercise is crucial, but I'm saying this so I don't have to feel bad about eating junk food. I have a sweet tooth, and it's never going to subside, so I need something to make my body burn it away so I can enjoy my favorite foods. It's a simple request really. No picture for this one either. Sorry. I searched and searched and this was the best pic I could find. Cure for the Common Cold & Cancer - Knowing that there are several different strains of the common cold, I know this is a difficult task, but I have faith in our scientists to one day be able to rid us of the snifflies and coughs. I also have faith that one day we will rid the world of cancer in all its forms. Then we can all live longer! Which brings me to my next item. Cryostasis - I think this is both a genius idea and a crazy one. I would love to be cryogenically frozen and wake up 100's of years in the future (just without the insane Vanilla Sky scenario). I want to be able to see what the world would be like in the future beyond my own lifetime. How cool would it be if say George Washington had been placed in Cryostasis and woke up this year? I think he would be both amazed and frightened. I think that's an exhilirating thought! I also find this option more likely than time travel, because let's face it, time travel as much as we all wish were possible, just isn't. I waste more wishes than I should that The Doctor will show up in my living room inviting me to join in his travels inside the TARDIS...but I keep doing so, because you never know. Space Travel - Aside from the fact that Obama and his minions curbed space exploration, I believe it will be rebooted and we will go further than we ever have. And in doing this we will find life on other planets, and start mingling with them (you take it however you choose). We will also have ships that you can live and work on. Much like Star Trek. It will be awesome, and a good time for all. I would love to be able to travel to distant planets and meet other people whether they're green, blue or look like me. I would also join the fleet and work upon a starship (how else are you going to meet the aliens?). I also see space travel being more likely to end up as through Joss Whedon's vision of the future in Firefly, where we would colonize other earth-like planets. I could handle the wild west if I could still have my cell phone and a laser gun. Robots/Androids/AI - How fun would it be to have a robot for a friend? Whether they call themselves a robot, android or AI, I wouldn't care. I always imagined my robot friend to be a cross between Data, Jude Law in ai, and Robin Williams in Bicentennial Man. Therefore he would look like Jude Law, with the passion of Robin Williams and the logic of Data. Don't ask me why. I think in time we really will have more robotics, and I do see them being humanoid. I just hope that they don't go all iRobot or Terminator on us. Which will most likely happen. And I hope by the time they turn on us, I have gone into cryostasis and wake up to find we won the war. Not likely though. This pretty much sums it up for now, but if you want to add some of your ideas for the future, I would love to hear them. I want to go to space too!